Shopping Express®: complimentary return tickets on the luxury coach service from central Barcelona to the Village. VIP Card: offering an additional 10% saving in the Village boutiques. €25 La Roca Village Gift Card: to use in the boutiques of your choice at La Roca Village. THREE-course lunch: at Pasarela restaurant. Enjoy a perfect day of retail therapy at La Roca Village with this exclusive package offering a unique and unforgettable shopping day for just €64 per person. This special package includes return tickets on the Shopping Express®, the luxury coach service from central Barcelona to La Roca Village, a VIP Card (providing an extra 10% saving on the outlet price), as well as a €25 prepaid Gift Card to spend in any boutique in La Roca Village throughout this unmissable day. In between browsing luxury boutiques, indulge in lunch at Pasarela restaurant, which offers a variety of delicious choices. Purchase your La Roca Village package online here. To redeem the package, please present your confirmation email at the Shopping Express® departure point and again at the La Roca Village Tourist Information Centre to receive your VIP Card, €25 La Roca Village Gift Card and lunch voucher (THREE-COURSE LUNCH) . A €25 Gift Card to spend in any boutique at La Roca Village. The Gift Card is only available for Adult packages which takes 48 hours to process and therefore cannot be redeemed within that time. Visit Pasarela restaurant at La Roca Village where you can exchange your voucher for a two-course lunch with water and coffee. Additional courses and beverages will be subject to charges in the restaurant. Packages available for adults and children under 12 years. €50 La Roca Village Gift Card: to use in the boutiques of your choice at La Roca Village. Enjoy a perfect day of retail therapy at La Roca Village with this exclusive package offering a unique and unforgettable shopping day for just €89 per person. This special package includes return tickets on the Shopping Express®, the luxury coach service to travel in style from central Barcelona to La Roca Village, a VIP Card (providing an extra 10% saving on the outlet price), as well as a €50 prepaid Gift Card to spend in any boutique in La Roca Village throughout this unmissable day. In between browsing luxury boutiques, indulge in lunch at Pasarela restaurant, which offers a variety of delicious choices. Purchase your La Roca Village package online here. To redeem the package, please present your confirmation email at the Shopping Express® departure point and again at the La Roca Village Tourist Information Centre to receive your VIP Card, €50 La Roca Village Gift Card and lunch voucher. A €50 Gift Card to spend in any boutique at La Roca Village. The Gift Card is only available for Adult packages which takes 48 hours to process and therefore cannot be redeemed within that time. Visit Pasarela restaurant at La Roca Village where you can exchange your voucher for a two course lunch with water and coffee. Additional courses and beverages will be subject to charges in the restaurant. Entrance and audio guide: to the Gaudí Crypt and much more. Few events combine a cultural visit to a breath-taking architectural and historical site with luxury outlet shopping for just €23 per person. This special package includes return tickets on the Shopping Express®, the luxury coach service from central Barcelona to La Roca Village and a VIP Card (providing an extra 10% saving on the outlet price). 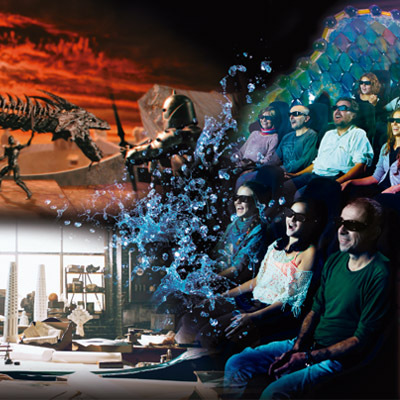 In addition to a memorable day of retail therapy, the package also includes admission to the Gaudí Crypt with a premium audio guide. 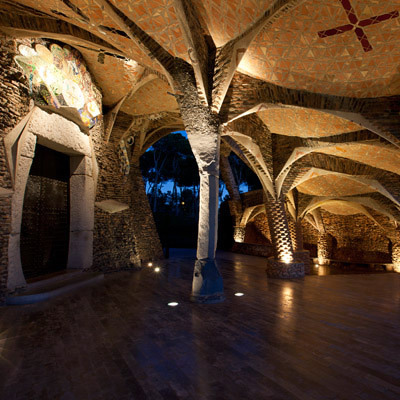 Discover Gaudí’s hidden treasure, the Gaudí Crypt, located inside Colonia Güell, a textile village packed with surprises, just 20 minutes outside of Barcelona. The Crypt is a church of twisted columns, the laboratory for the Sagrada Família which was declared a World Heritage Site by UNESCO in 2005. 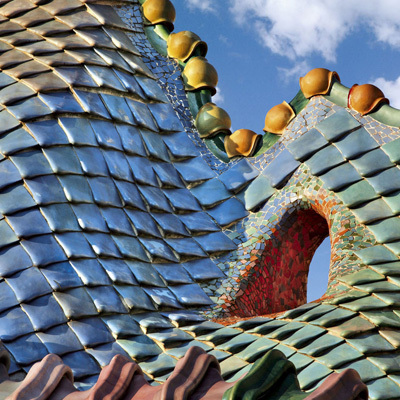 Enjoy an unforgettable cultural experience as you explore one of Gaudi’s masterpieces. Purchase your La Roca Village package online here. To redeem the package, please present your confirmation email at the Shopping Express® departure point, at the La Roca Village Tourist Information Centre to receive your VIP Card and again at the Colonia Güell visitors’ centre. Entitles you to 10% off all purchases in participating boutiques (consult the list at the Tourist Information Centre). The VIP Card is valid only for La Roca Village, has no cash value and is for personal use and non-transferable. The VIP Card cannot be used for previously made purchases and is not valid in conjunction with any special offers, on already reduced prices or as part of special offers. Colonia Guell This package is available during the following days: WINTER	01.11 / 30.04	Weekdays	10h - 17h	Saturdays, Sundays, and Holidays	10 - 15h SUMMER	01.05 / 31.10 Weekdays	10 - 19h Saturdays, Sundays, and Holidays	10 - 15h Booking from/to dates: February 1st 2018 – December 30th 2018. Travel from/to dates: Febriary 2nd 2018 – December 31st 2018 Cripta Gaudí is closed the following days: January 01st, and 06th, April 1st and 06th, December 25th and 26th. Gaudi Guided Tour: including fast track entrance and audio guide to the Sagrada Familia. See the Gaudí houses on Passeig de Gràcia, enjoy a guided tour to the unfinished temple of Sagrada Família, the jewel in the crown of genius architect Antoni Gaudí , including fast-track entrance and spend the afternoon in one of the collection of Chic Outlet Shopping® Villages across Europe, La Roca Village. The Sagrada Familia Tour departs at 10:00hrs from Plaza Catalunya, opposite the Tourism Office and in front of Deutsche Bank and Hotel Olivia Plaza. The tour lasts approximately 2.5 hours. The Shopping Express® to La Roca Village departs at 13:00hrs from Paseo de Gracia, 6 (the guide will assist you to locate the bus stop). This tour is dedicated to the single most important site in Barcelona, the Sagrada Família, the unfinished temple of the genius architect Antoni Gaudí, who spent the latter part of his life on this magnificent work. The jewel in the crown of Gaudí’s works, the Sagrada Família temple is the culmination of his career and synthesis of his overall conception of architecture. The richness of detail and its significance need explaining in order to appreciate this fascinating and extraordinary building in full. Gaudí wished the temple, which is still being built, to be financed by the people, not by taxes or funding, and that’s just what each entrance fee does (included in our tour price): contribute to the completion of the incredible building, begun in 1882. After visiting the Sagrada Família, our guide will show you where to take the Shopping Express® luxury coach to La Roca Village, one of the Chic Outlet Shopping® Villages, located 40 minutes outside Barcelona. Quality, attention to detail and five-star service are hallmarks of the La Roca Village shopping experience. 10% additional saving in the boutiques. Return to Barcelona at 18:00hrs. Purchase your La Roca Village package online here. To redeem the package, please present your confirmation email at the Shopping Express® departure point, at the La Roca Village Tourist Information Centre to receive your VIP Card and again at the Sagrada Familia visitors’ centre. Provides 10% off all purchases on the day of your visit to La Roca Village. The VIP Card is valid only for La Roca Village, has no cash value and is for personal use and non-transferable. The VIP Card cannot be used for previously made purchases and is not valid in conjunction with special offers, on already reduced prices or as part of special offers. A unique package combining the visit to Gaudí Experiència with Shopping at La Roca Village. Shopping Express®: complimentary return tickets on our coach service from central Barcelona to the Village. Purchase your package here online. To redeem the Package, please present the confirmation email you will receive at the Shopping Express™ departure point, and at de Gaudí Experiència ticket office. Entrance and audio guide: to the Casa Batlló. Few events combine a cultural visit to a breath-taking architectural and historical site with luxury outlet shopping for just €35 per person. This special package includes return tickets on the Shopping Express®, the luxury coach service from central Barcelona to La Roca Village and a VIP Card (providing an extra 10% saving on the outlet price). In addition to a memorable day of retail therapy, the package also includes admission to the Casa Batlló with a premium audio guide. Casa Batlló known as Gaudí’s Gem, is more than just a building, it is a monument of art, architecture and design. It is considered a unique architectural masterpiece of Modernism and has become one of the most emblematic works by Antoni Gaudí and also a symbol of Barcelona. The sensuality and harmony of the interior combined with the use of colours, shapes and light combine into a must-see landmark for all lovers of architecture. Enjoy an unforgettable cultural experience as you explore Gaudí’s masterpiece. Purchase your La Roca Village package online here. To redeem the package, please present your confirmation email at the Shopping Express® departure point, at the La Roca Village Tourist Information Centre to receive your VIP Card and again at the Casa Batlló ticket office to join the tour. Entitles you to 10% off all purchases in participating boutiques (consult the list at the Tourist Information Centre). The VIP Card is valid only for La Roca Village, has no cash value and is for personal use and non-transferable. The VIP Card cannot be used for previously made purchases and is not valid in conjunction with any special offers. The Casa Batlló is open 365 days a year, from 9.00 to 21.00, being the last entrance at 20.20. Packages are available for adults and children under 12 years. €200 La Roca Village Gift Card: to use in the boutiques of your choice at La Roca Village. Enjoy a perfect day of retail therapy at La Roca Village with this exclusive package offering a unique and unforgettable shopping day for just €200 per person. This special package includes return tickets on the Shopping Express®, the luxury coach service from central Barcelona to La Roca Village, a VIP Card (providing an extra 10% saving on the outlet price), as well as a €200 prepaid Gift Card to spend in any boutique in La Roca Village throughout this unmissable day. Purchase your La Roca Village Package online here. To redeem the Package, please present your confirmation email at the Shopping Express® departure point and again at the La Roca Village Tourist Information Centre to receive your VIP Card and €200 La Roca Village Gift Card. A €200 Gift Card to spend in any boutique at La Roca Village. The Gift Card is only available for Adult packages which takes 48 hours to process and therefore cannot be redeemed within that time. This package is only available for adults. €400 La Roca Village Gift Card: to use in the boutiques of your choice at La Roca Village. Hands-free Shopping Service: complimentary service to not carry with your purchases. Enjoy a perfect day of retail therapy at La Roca Village with this exclusive package offering a unique and unforgettable shopping day for just €400 per person. This special package includes return tickets on the Shopping Express®, the luxury coach service from central Barcelona to La Roca Village, a VIP Card (providing an extra 10% saving on the outlet price), as well as a €400 prepaid Gift Card to spend in any boutique in La Roca Village throughout this unmissable day. Also enjoy complimentary use of the Hands-free Shopping Service (subject to availability). You won’t need to carry your bags around the Village, just telephone 15 minutes before you wish to collect your purchases and they'll be waiting for you at the Tourist Information Centre. Purchase your La Roca Village package online here. To redeem the package, please present your confirmation email at the Shopping Express® departure point and again at the La Roca Village Tourist Information Centre to receive your VIP Card, €400 La Roca Village Gift Card and Hands-free Shopping Service wallet, before making your purchases with total peace of mind. A €400 Gift Card to spend in any boutique at La Roca Village. The Gift Card is only available for Adult packages which takes 48 hours to process and therefore cannot be redeemed within that time. You will be asked to show proof of identity and the receipts from each boutique you purchased items from as part of the Hands-free Shopping Service, before collecting your purchases when you have finished shopping. Please note Hands-free Shopping Service is subject to availability.